The plain white tapa strip, which has been through previous water baths and perhaps even a bleach treatment, has shown me only orange rust stains. 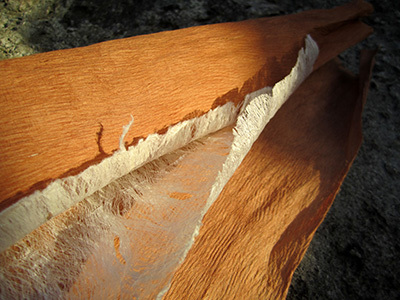 However, the two pre-dyed tapa strips reward me with a remarkable result when I return the next day. 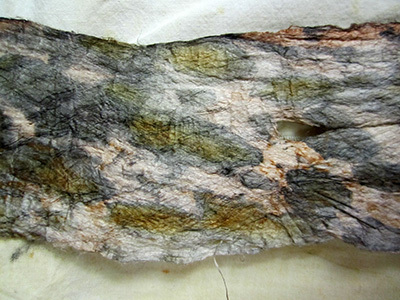 My theory was correct: the pre-dyed pieces of tapa show black stains after the chemical reaction between the tannin-rich plant dye and the iron oxide. I can’t figure out how the brass-coloured stains come about, but it’s the black I’m after at this stage. It makes me wonder what would happen, if I tied a piece of Banyan (Ficus prolixa, on Atiu called ava) around my magic rusty rod. 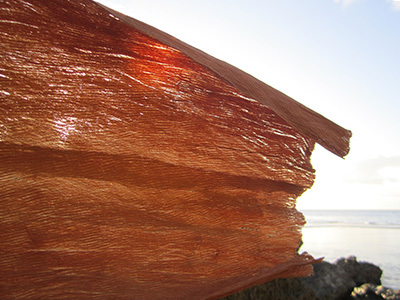 Beaten Banyan bark naturally turns a rich orange brown. Two fermented pieces have been joined together by beating. Perhaps this kind of tapa still contains enough tannin to react with the iron oxide?